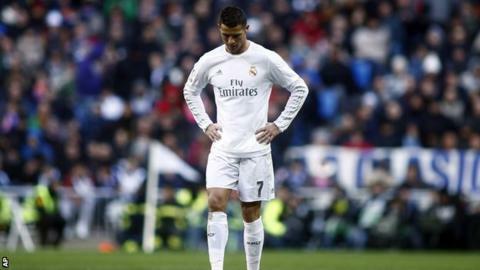 Real Madrid forward Cristiano Ronaldo said "if we were all at my level maybe we would be leaders" after his side's 1-0 derby defeat by Atletico Madrid. A first defeat under Zinedine Zidane leaves Real nine points behind leaders Barcelona, and four below Atletico. Real were missing Gareth Bale and Marcelo through injury, while Karim Benzema was replaced at half-time. "I don't want to disrespect anyone, but when the best players aren't available it's harder to win," Ronaldo said. "I like to play with Karim, with Bale, with Marcelo. "I'm not saying the others like Lucas Vazquez, Jese and Mateo Kovacic are not good players - they are very good players - but it's not the same." Afterwards he sought to clarify his quotes, telling Marca: "When I say that, I am talking about my fitness level, not my level as a player. I am no better than any of my team-mates." Antoine Griezmann scored the only goal of the game as Atletico became the first team to win in three consecutive La Liga trips to the Bernabeu. Ronaldo used an expletive to describe how he feels the media describe him and added "but I don't listen to what the press say. The statistics and numbers don't lie". Zidane had been unbeaten in his first eight La Liga games, although they have dropped from two points behind Barca to nine. Atletico played in the Champions League away to PSV Eindhoven on Wednesday, drawing 0-0, while Real had not played since last weekend. Zidane said: "We were not as ready for the game as we thought we were. All I can say is that it's not just about our fitness. "The players are not unfit, it's a question of everything. We didn't play the game we had prepared. "They played on Wednesday and had less time to recover, and look at the game they played. So it is a mental question. We lacked a bit of everything. "I told the players that we have to keep on going, I can't be happy with this performance and neither are they, but we can't give up. I have a clear idea of what went wrong today."